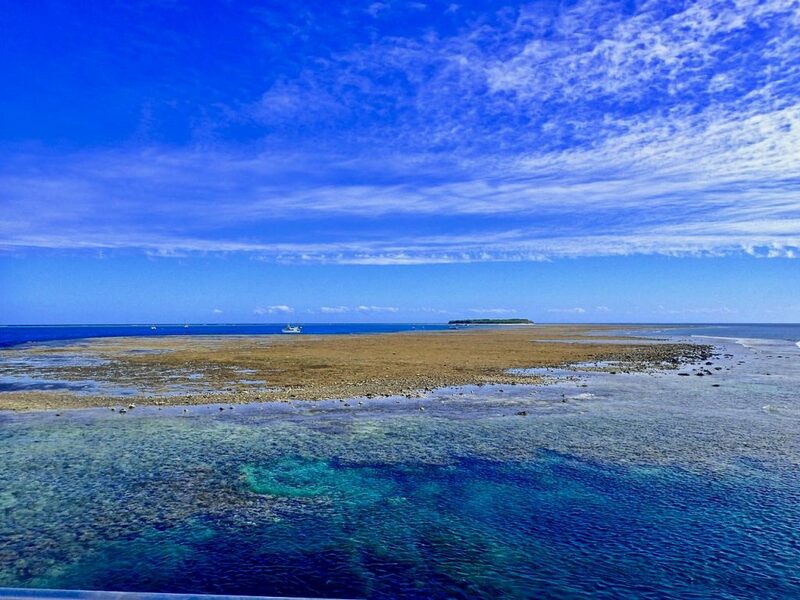 Above: The reef at low tide, with Lady Musgrave Island in the distance: top of coral adapted to withstand air and sun for several hours each day. The Great Barrier Reef (GBR), one of the seven natural wonders of the world and Earth’s largest reef: 2300 km in length. 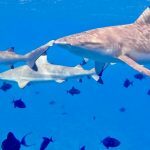 It begins in the Coral Sea, off shore of the north eastern tip of Australia and stretches south, to just north of Brisbane. It is so massive that it is visible from space. 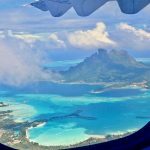 It is home to a huge variety of oceanic mammals, reptiles, fish and birds. It is also dying at a tragic rate. Global warming is largely to blame and horrifyingly, Cyclone Debbie is causing further damage as flooded communities on the mainland leach polluted water into the sea. Above: thriving coral, southern GBR. 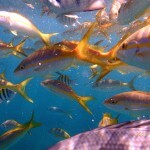 Below: close ups of a variety of fish exploring the coral. 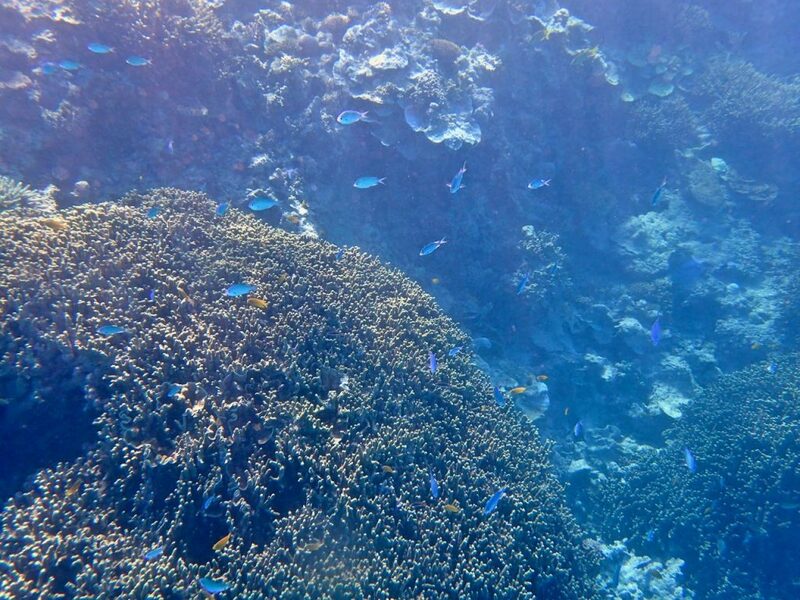 My family wants to see the reef for ourselves, to capture the natural wonder while it still exists. 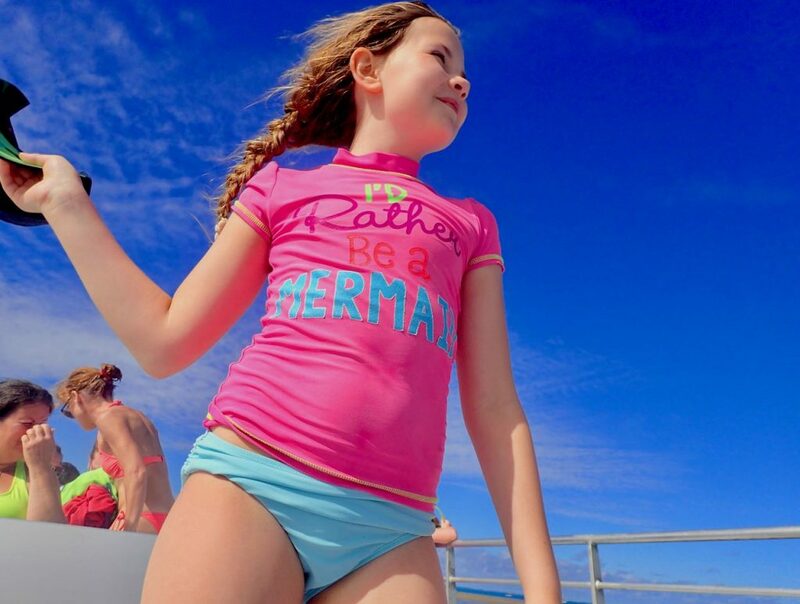 We visit the southern end of the GBR. 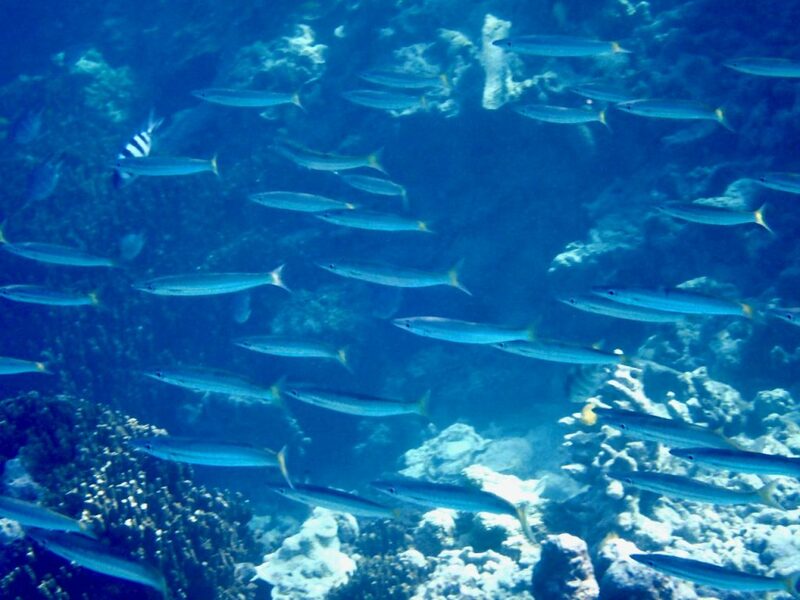 The Southern reef is the healthiest—the sea is slightly cooler. Above: me, onboard Main Event, braving a relatively calm sea ( 10 knot wind) for the 2 1/2 h ocean trip to the reef. 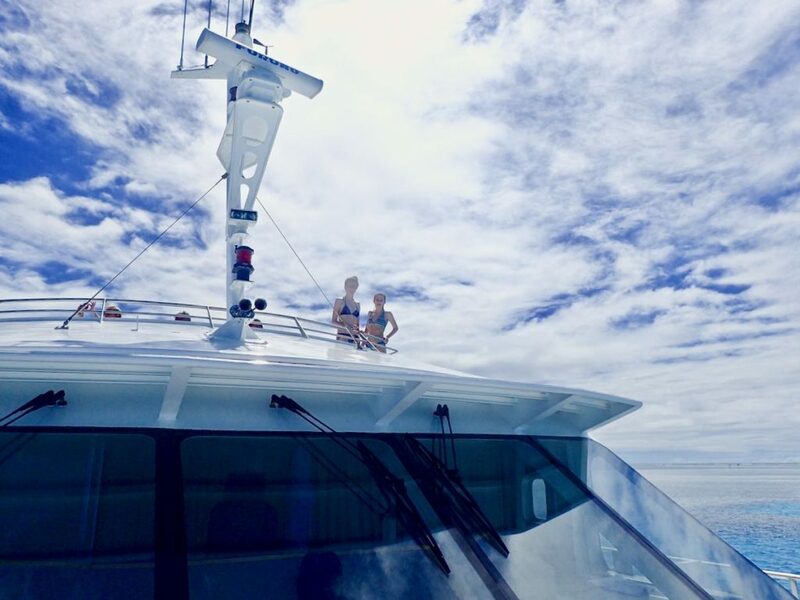 We drive to Bundaberg (4 h north of Brisbane), then hop on board a luxury, 3 story, 27m catamaran (Main Event) and sail 52 nautical miles from shore. 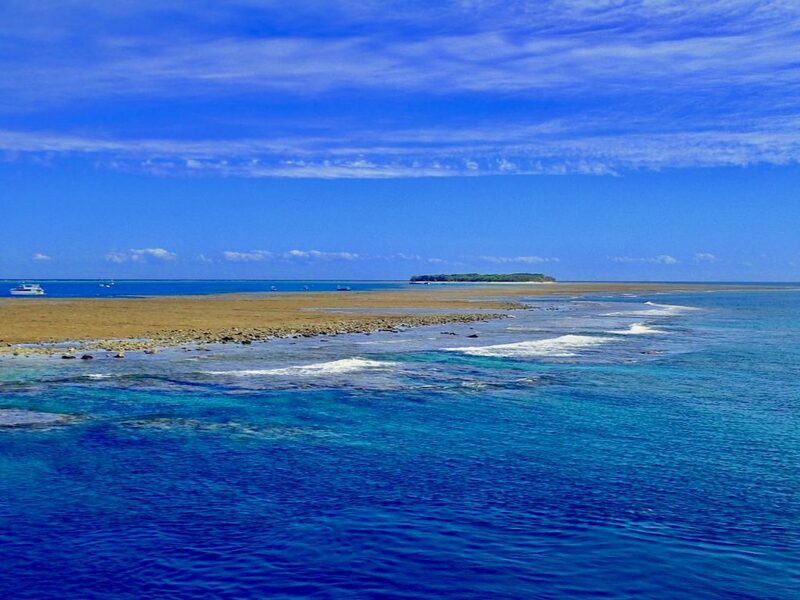 Our destination is the reef that surrounds Lady Musgrave Island. 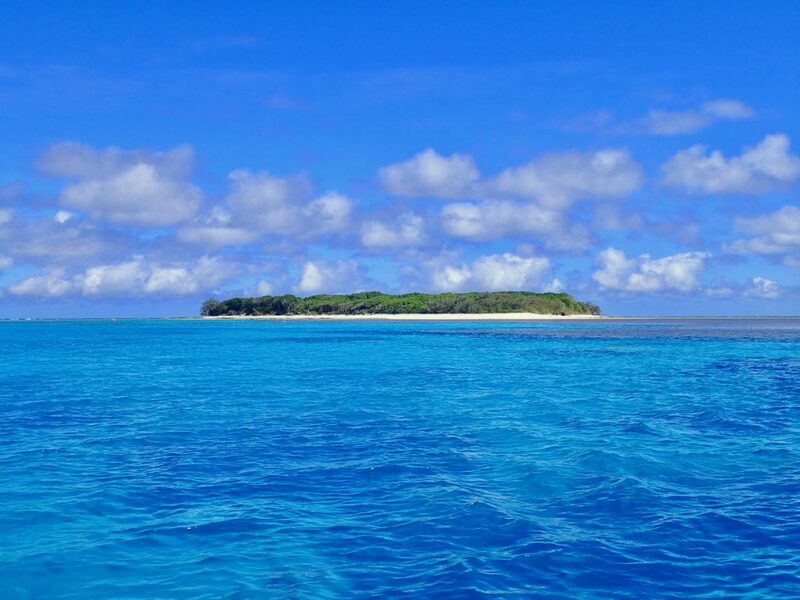 The Island is a coral cay and 8 km of the GBR surrounds the Island. 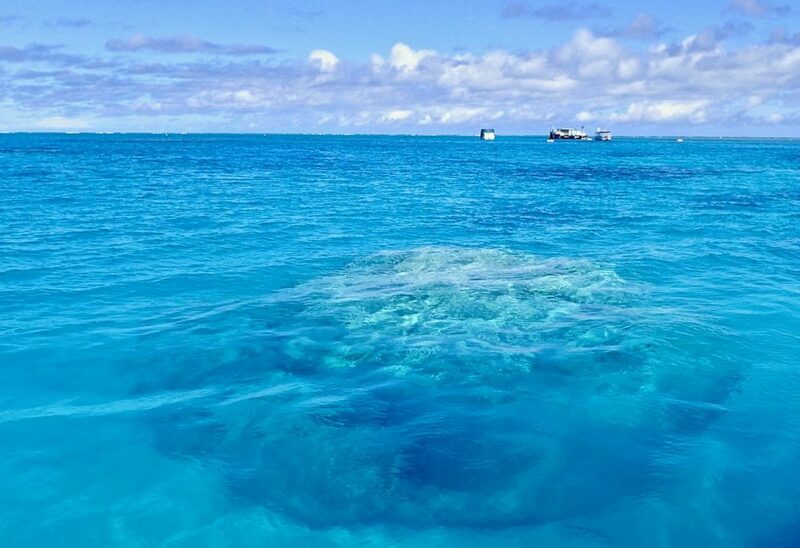 The reef forms a natural lagoon, ideal for snorkelers. Rough currents are tamed by the reef; however, snorkelling too near the reef, one can get swept over the reef and out to sea. 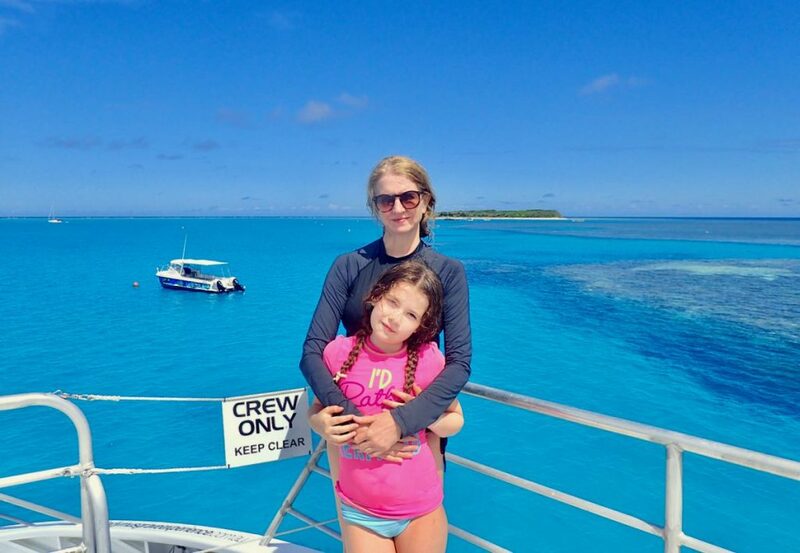 Above: the sun is out, the Coral Sea is brilliant turquoise, Lady Musgrave Island appears—we have arrived at the Great Barrier Reef! Last Musgrave is a true coral cay: the Island was formed from broken coral and sea debris that was swept to the reef and gradually built up on the reef; then, birds stopped to rest on the debris, adding their bird poop (with tree seeds intact). 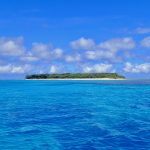 Soon, the poop formed a soil for the tree seeds to germinate and as the trees grew, their roots helped keep the whole “jalopy” together; hence, Lady Musgrave Island was born! 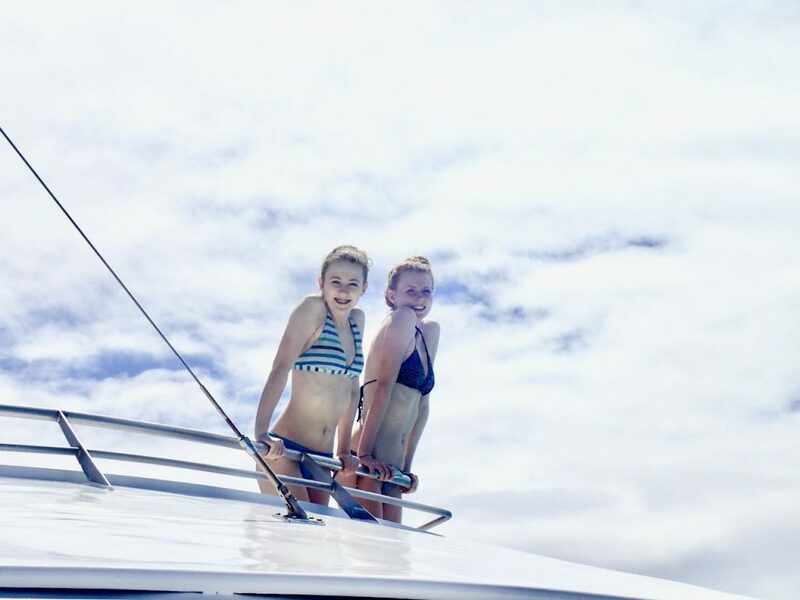 Above: Mist and Tabs enjoying the sun, sea and sky at the Great Barrier Reef. 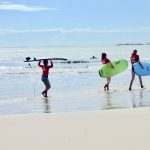 I had to snap few pics of the glamour girls, thrilled to reach the reef, inhaling the fresh air and leaving sea-sickness behind them. On the way to the Island, the sea is relatively calm (10 knot wind). We are lucky and spot dolphins and many sea birds. 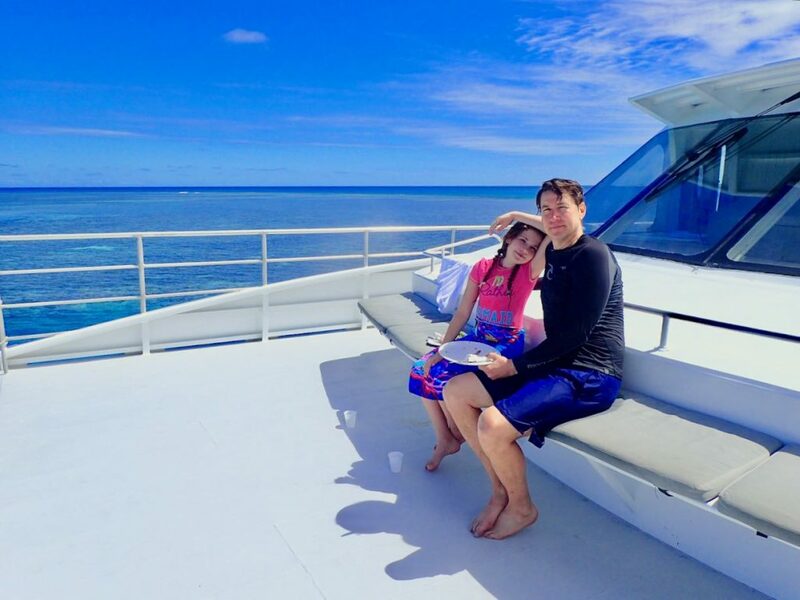 Peter and the girls suffer from a little sea sickness as we cruise over open ocean to reach the island. Above: I jump in the Coral sea, snorkel gear on, ready to explore. Since we are basically in the middle of the Coral Sea, the lagoon water is deep. 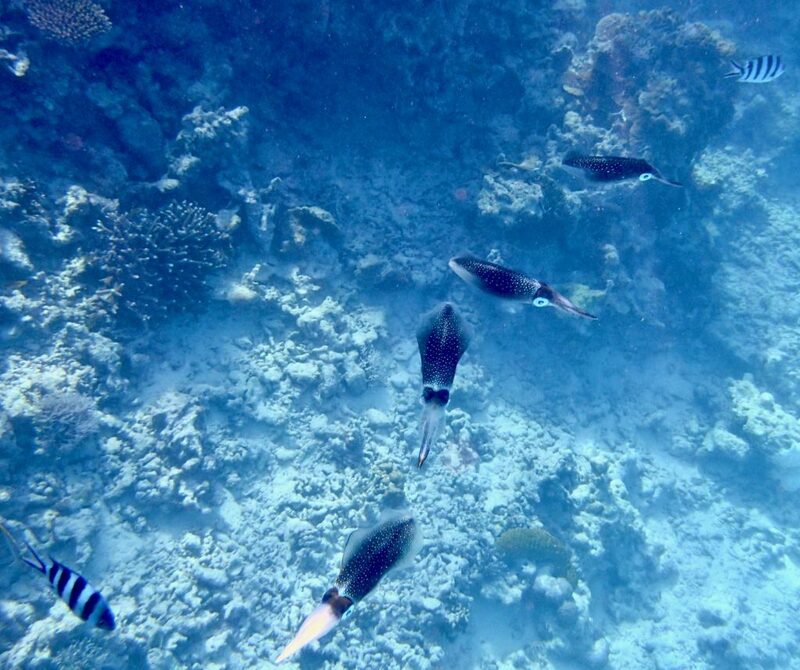 We snorkel high above the base of the reef. 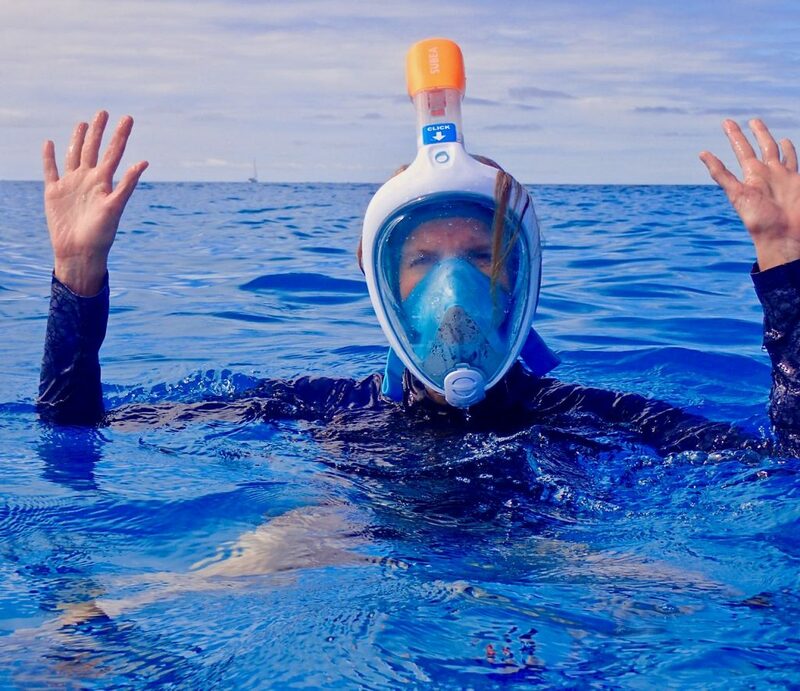 The water is warm, the currents occasionally strong, the reef very long and fascinating; I might be out there a very long time and it’s a long way back to the boat—rethinking turning down the life jacket! Above: Green Sea Turtle, resting on coral. 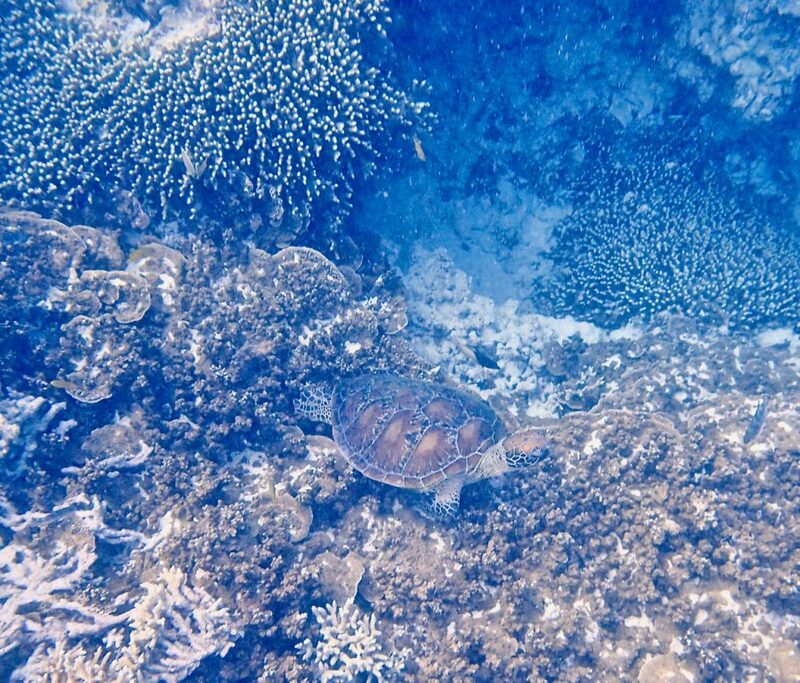 There are many turtle-cleaning stations at the reef: spots were turtles rest on the coral are worn into round-shaped, smooth, indented beds. The turtle selects a spot, deep in the sea and rests on the coral. As the turtle rests, other sea creatures arrive and clean the turtle of parasites and then the turtle resurfaces for some air. 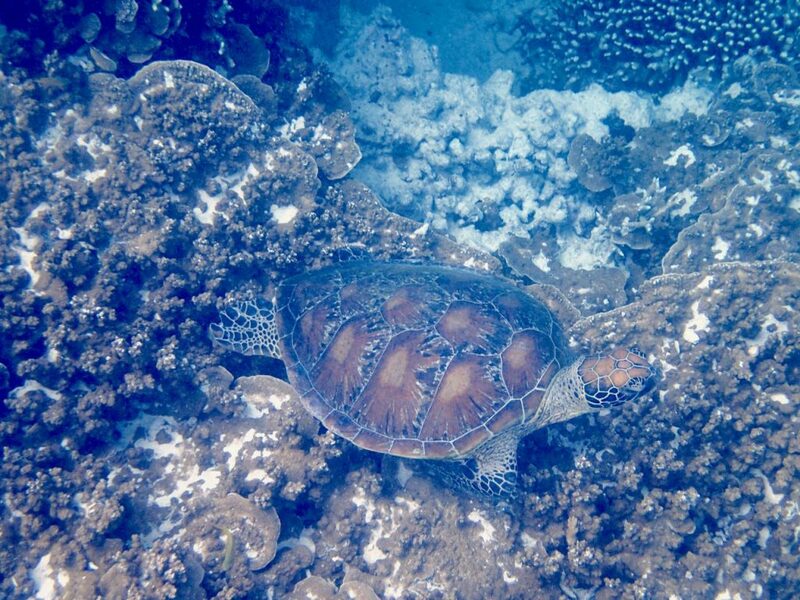 Above: a close up green turtle on coral. 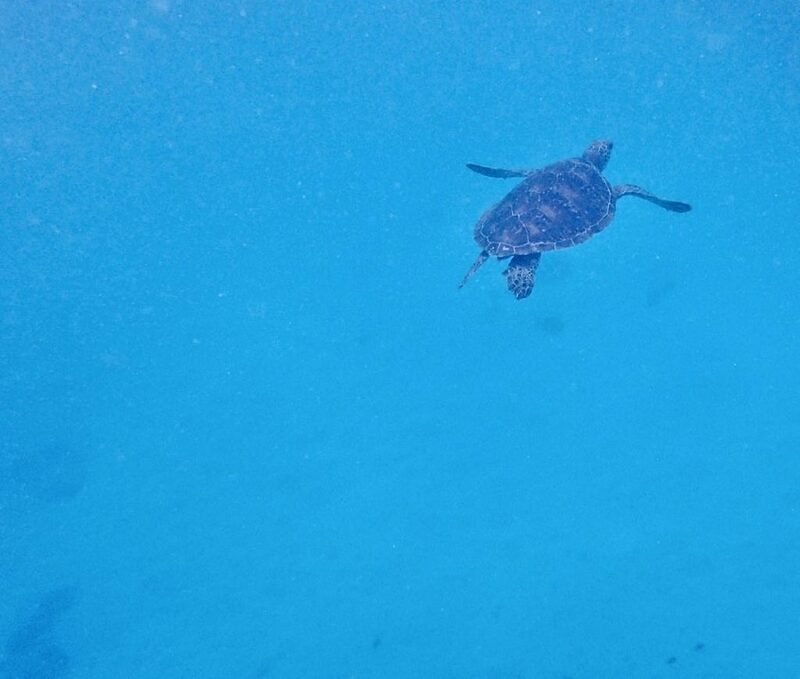 Below: another turtle swimming through the sea, heading up for air. It is important to give sea turtles space. They will drown if tourists swim over them and prevent them from surfacing for air. 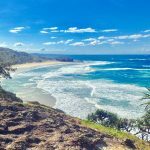 There is truly no place more exhilarating, wild, fresh and beautiful than the GBR. Every cell of my being felt alive and connected to the universe during my time spent at the reef. These natural, fragile, utopian places that exist on Earth are truly the only things that matter in life and yet, humanity is killing them !? 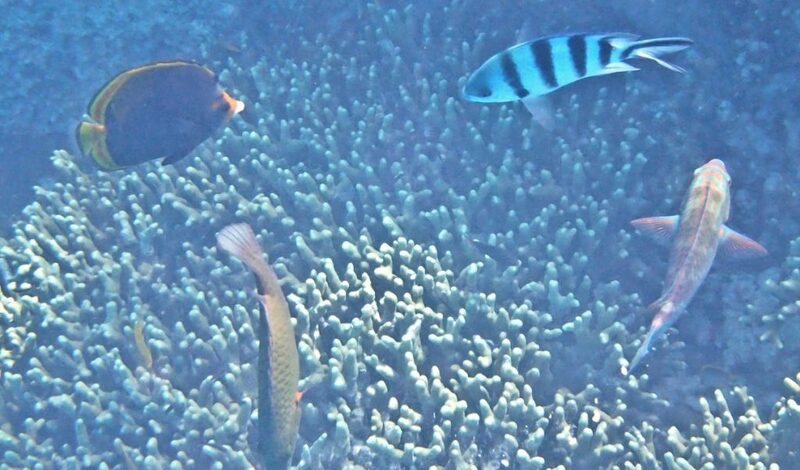 Below: views of the reef with a variety of coral and fish. Below: although this southern area is the only healthy section remaining on the Great Barrier Reef, you can see some damage to the reef. 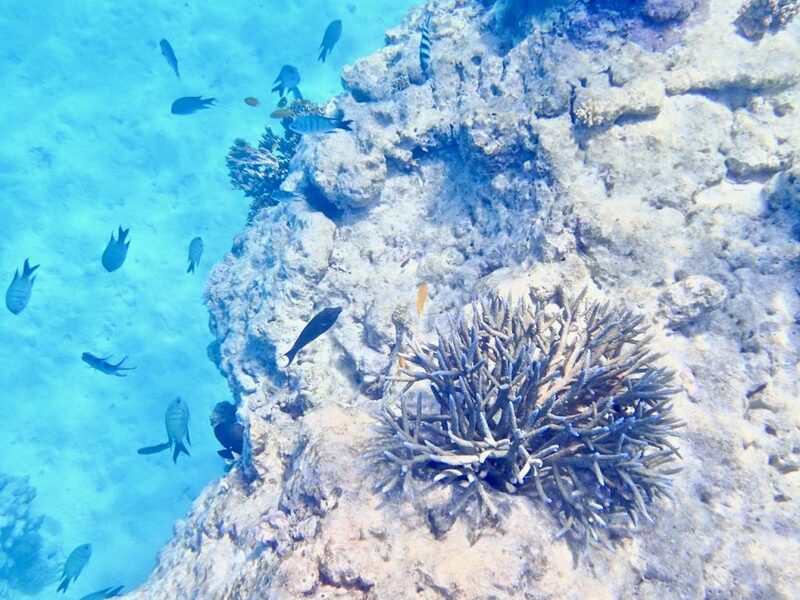 The Great Barrier Reef is paradise. I could easily sleep on the catamaran and stay for another day of snorkelling in the lagoon. 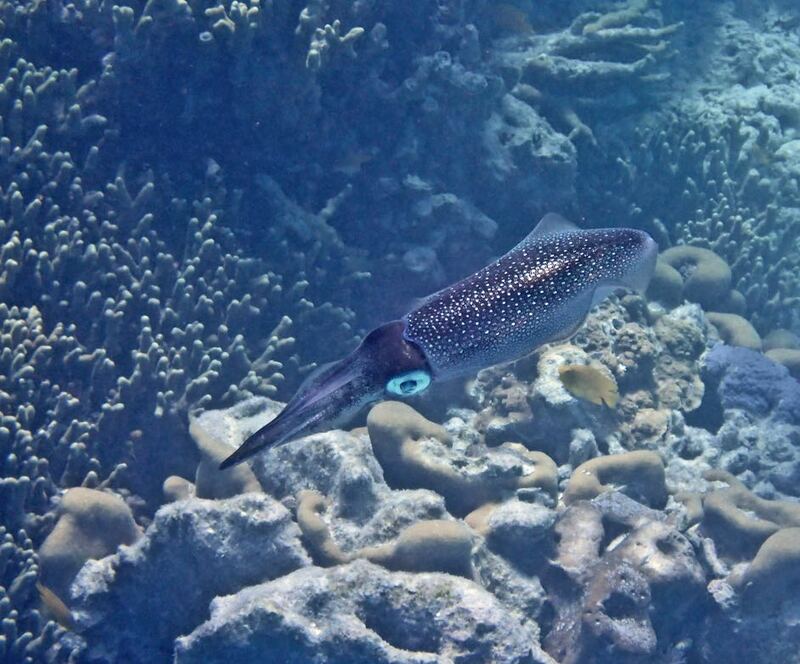 Below: my first time snorkelling with beautiful iridescent squid. Below: squid and sea cucumber (looks like a gold coloured leaf). 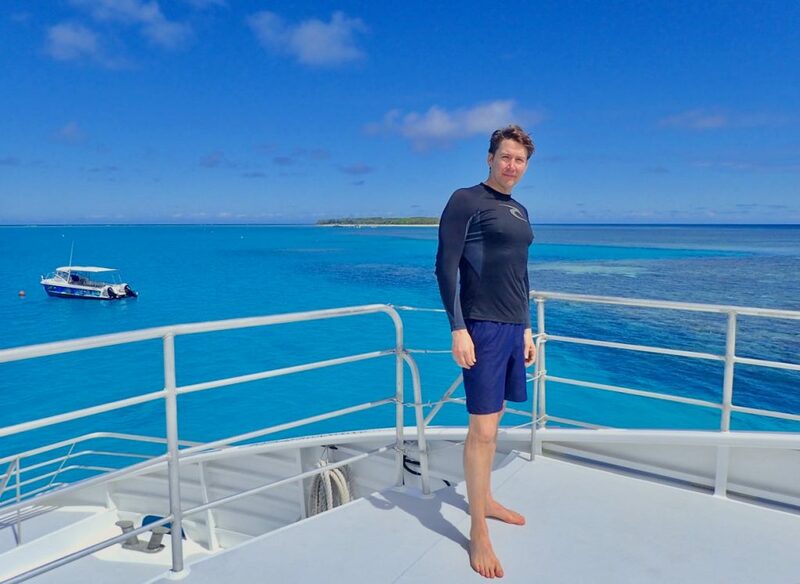 Lunch Break on the Main Event: the reef and Lady Musgrave Island are visible in these pictures. 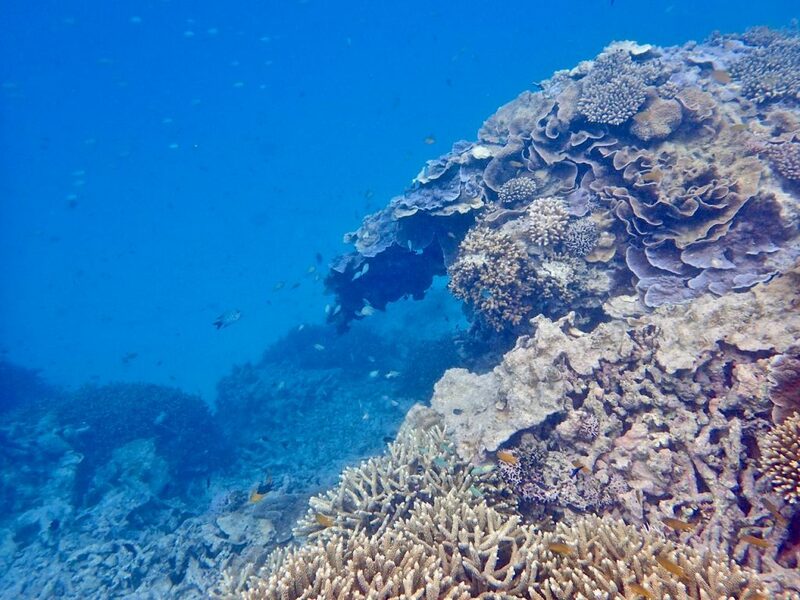 Below: the tide moves out during our time at the reef and the top part of the reef is exposed for several hours. 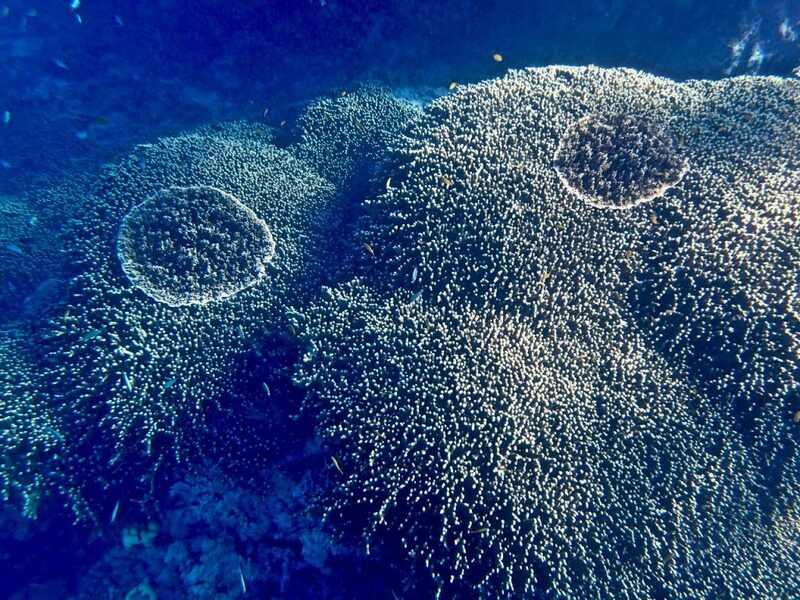 Interestingly, the coral produces a mucous-like sunscreen that protects the areas exposed during low tide. The coral can withstand only a few hours in the air and sun. Below: boulder coral. 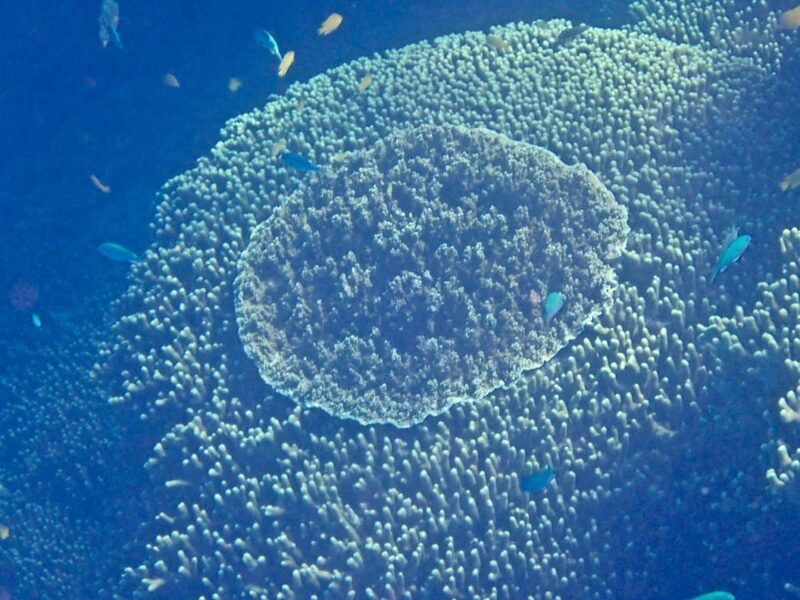 It looks like a huge rock in the ocean but it is actually a great, big, mound of living coral. The trip back to Bundaberg is smooth sailing. Peter and Tabs decide to spend the time soaking up the Northern Australian sun. 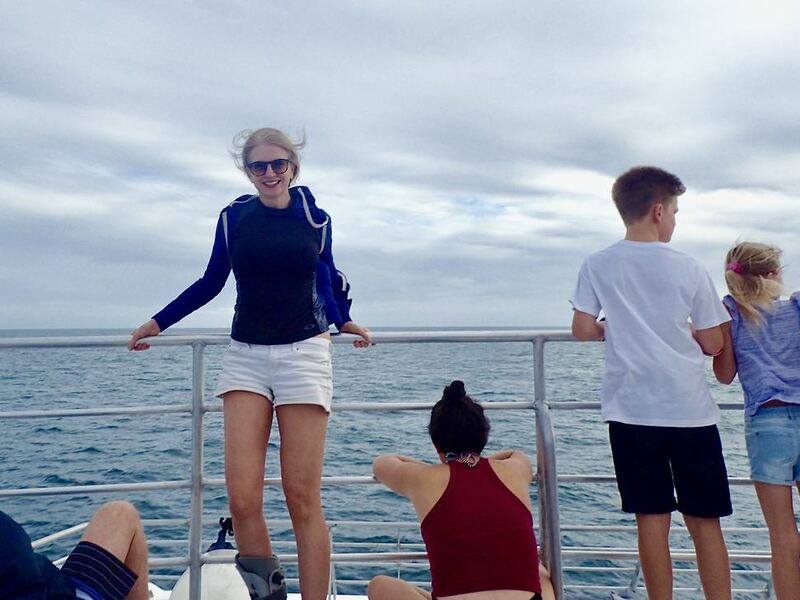 Hope you have enjoyed joining us on a trip to the Great Barrier Reef. *I have so many photographs that I’ve decided to save exploring Lady Musgrave Island for my next blog. 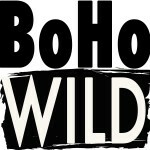 Stay tuned, the Island is magical ! Thank you. It is the most shockingly perfect place on Earth and so devistating to loose it.